A cigar that carries an aura of history with it. 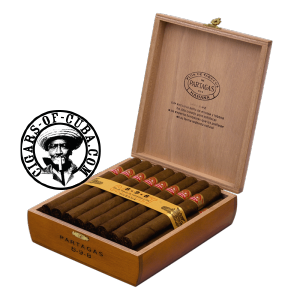 Well known for its peppery qualities, this Lonsdale is very popular with the lovers of the Old Havana type cigar. The 8-9-8 (called so, as it is packaged in layers of 8 cigars on 9 cigars on 8 cigars) remains a Partagas and therefore sports a powerful body, climaxing with a very strong finish. Interestingly mild when very young, this cigar will need a few years to find a balance of blend and strength. It's the reference for the Dalias. Not to be confused with the Partagas unvarnished 8-9-8. A regular cigar with a toasty taste.